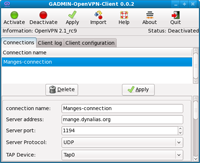 GAdmin-OpenVPN-Client is an easy to use frontend for the OpenVPN client. It handles multiple connections and can import exported connection setup packages from the GADMIN-OpenVPN-Server. Now you should be able to start it by typing GAdmin-OpenVPN-Client at a shellprompt or from GNOME or KDE’s program menus and youre ready to add some scopes.